Last week's Facebook Marketing Conference (fMC) brought a slew of big changes to the platform. Facebook has yet to fully deploy all of the new features, and we will not be able to gauge the true impact for quite some time. The outcomes depend not on what Facebook does next but how users, brands and regulators react. Here is what Facebook hopes will occur: Users continue to adopt Facebook into their lives, giving advertisers more reasons to purchase new forms of social advertising on the platform. Users win with access to the most powerful, free communications tool in human history; advertisers win with access to consumers where they spend more online time than any other site; and Facebook wins by earning more marketing dollars they need to justify their post-IPO share price. FTC pushes for much more obvious disclosure of sponsored ads in users' newsfeeds: Allowing marketers to turn their posts into ads within the newsfeed is not new--Twitter is already doing the same thing with Promoted Tweets--but is the fact these are paid ads obvious enough to users? The Federal Trade Commission (FTC) has a longstanding standard that people must recognize ads as such and cannot be duped into thinking advertising is content. The danger was framed well (inadvertently) by Forbes when it said, "The more Facebook 'ads' look just like the posts people and brands are already making on Facebook, the less they are likely to be seen as intrusive." True, and the more likely they are to run afoul of regulators. mobile ad features no disclosure. 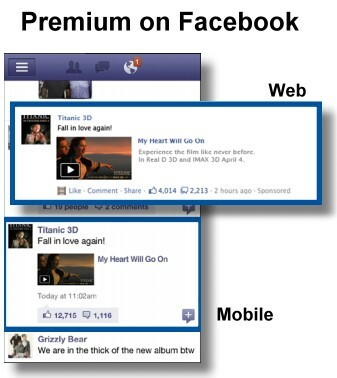 ﻿﻿﻿In the fMC presentation, Facebook displayed two versions of Premium on Facebook advertising. The one shown on a desktop browser has a tiny "sponsored" at the end, while the sample mobile ad contained no such disclosure. This may have been an oversight by a graphic designer assembling the fMC presentation, but even the desktop version of these ads could call into question whether consumers can really, in clear and conspicuous fashion, identify advertising from content. Search engines struggled with this same problem in the early days of the Web, when some search engines allowed brands to buy their way into the results or to purchase ads that were almost indistinguishable from organic results. A decade ago, Google recognized this was a problem and set itself apart, promising, "Every ad on Google is clearly marked as a 'Sponsored Link' and is set apart from the actual search results." The FTC also recognized the problem and issued a "landmark recommendation to the search engine industry that it should improve disclosure of paid content within search results." It would not surprise me, given the reach of Facebook, if the FTC jumps into this very same issue again. Users revolt and leave Facebook: Facebook is so deeply integrated into users' habits and into web sites that it is hard to imagine Facebook could face an exodus, although some folks seem to predict this with every change Facebook makes to the user interface. Back in 2009, the New York Times ran an article entitled "Facebook Exodus," noting "Things fall apart; the center cannot hold. Facebook, the online social grid, could not command loyalty forever." While the obituary was wildly premature, the article closes on a cautionary note as relevant today as three years ago, asking, "Is Facebook doomed to someday become an online ghost town, run by zombie users who never update their pages and packs of marketers picking at the corpses of social circles they once hoped to exploit?" Users revolt and unfriend large brands: Of course, Facebook users do not need to abandon Facebook and their existing social graphs if they object to seeing ads in their newsfeed--all they need to do is unfriend the advertisers. When using Premium on Facebook advertising, only a brand's fans will see the sponsored story in their home page newsfeeds; someone not connected to the brand will see the story in the right-hand side of their homepage where, as we all know, it is unobtrusive and easy to ignore. The fewer brands you like, the fewer sponsored stories you will see in your newsfeed. Of course, Facebook would argue--with great merit--that these sponsored ads are really just brand posts that might have organically appeared in fans' newsfeeds in the first place. It is likely Facebook users will not object to seeing sponsored posts from the brands they truly like, provided those posts are relevant and Facebook keeps the mix of brand-to-human posts lean. The onus is on the advertisers to make sure the posts they make and select are interesting to the audiences they target, or else brands could see fan counts shrinking for the first time in Facebook's comparatively brief history. Brands may not adopt Facebook's new ad media in large numbers: It seems unlikely, but it is possible that marketers are just not prepared for the dynamic new ad model Facebook has unveiled. This is not your father's advertising with long lead times and carefully crafted creative. Instead, brands will need to monitor the effectiveness of their organic content, strike when the iron is hot and create an ad out of a post that is demonstrating great engagement. Agility is not exactly the strong suit of most large marketing organizations. Says Bryan Wiener, CEO of 360i, “The industry is not set up to support the new world order... Facebook is making it incredibly difficult for these companies.” He predicts Facebook's approach may require big disruptions in the way marketers and their agencies work. Brands may demand powerful ways to unfriend fans: Many brands accumulated "friends" with little to no relationship with the brand. They offered Farmville items or sweepstakes entries in return for new "likes," which seemed like a good idea when it boosted brands' fan counts. But now Facebook is increasing the importance of paid media relative to earned media, and that means that brands with more fans will pay more. If you are Starbucks and your fans are true fans, Reach Generator may be worth the investment, but if your brand has a million fans who cared more for the freebie they got than for the brand, you're about to find out how expensive a mistake you have made. Augie does not like Gerber. I once "liked" the Gerber brand even though I have no children and couldn't care less about Gerber. I did so because I wanted to vote for a friend's child in a photo contest. Now, if Gerber wishes to use the new Facebook Reach Generator, the brand is stuck paying to serve ads to me--a truly and thoroughly disinterested consumer. What should a brand do if it accumulated many disinterested fans? It is not clear since there are no tools for managing your fan base in meaningful ways. Facebook is not like email--you cannot delete fans who have failed to open or click on your posts, nor can you target your posts based on source codes. Gerber and brands like it that engaged in a race for inauthentic "likes" may soon demand Facebook offer tools to pare fan counts in order to increase their advertising effectiveness. More investment in owned communities: Some social media professionals have been questioning if owned communities have a role in a world dominated by Facebook. Why invest in your own Lithium or Salesforce.com community, they ask, if you can build a community on the platform already used by almost one billion people? I have never bought this line of reasoning, because Facebook never really offered brands the opportunity to build true community. With the new timeline design reducing the prominence of fans' posts, it is an even weaker community-development platform today. Done right, Facebook and owned communities are not competitive but collaborative. Facebook's changes could push more companies to consider the value of building their own communities because brands will see an increase in cost to communicate with customers on the Facebook platform. In a New York times piece, Ben Winkler, chief digital officer of OMD, said it nicely, “The Facebook platform is undeniably incredible, but we must acknowledge that our customer relationships there are not owned — they’re rented.” Facebook may have just made it evident how important it is for brands to own their fans, not merely rent them. For every action there is an opposite and equal reaction. Newton's Law of Motion works just as well in marketing and social media as it does with physics. Facebook just released a metal ball in one of the world's most valuable Newton's Cradles. A reaction is all but certain, but exactly what that reaction might be is unknown. What do you think? Will Facebook's changes cause no stir among regulators and users? Will marketers adapt to a new way of real-time social advertising? Are there other reactions we might expect in the coming months? Please share your thoughts in the comments below. Real-time ad spending could happen, but you're right, it will require a nimble organization AND a nimble agency. What's disappointing as a brand marketer is the fact that we have to pay to message fans who already connected with us. And what of small businesses? Can they even compete anymore on Facebook's new large-brand platform? Augie, thanks for being the voice of sanity (and smart strategy) among a herd of gung-ho Facebook lemmings. Most Facebook marketing "experts" can't bring themselves to say ANYTHING critical about the platform, which makes me wonder what type of value they can actually bring to their jobs. I see negative consequences around many Facebook changes, particularly with the latest ad products and the atrocious layout called Timeline. Most notably, I think Facebook has finally separated potential customers into “haves” (big brands) and “have nots” (SMBs). Just the rapid pace of change means small businesses can’t keep up. Likewise, by offering special ad products only to advertisers spending big bucks (ironically, to help counteract abysmal organic Edgerank performance) indicates that Facebook is betting the bank on a small group of big brands. I predict we’ll see MANY abandoned (or at least “broken” brand pages) by SMBs in the next few weeks. Indeed, I wouldn’t be surprised if Facebook pushes back the mandatory Timeline conversion date when the company sees that only a tiny percentage of companies have converted voluntarily. That has happened with personal Timelines. But what is the incentive for small businesses to continue investing time and money into Facebook? There are many stats out there to indicate that approximately 90 to 97 percent of fans (depending upon who is measuring) will never visit a Facebook page after Liking it and now it appears that the only reliable way to show up in fans’ feeds is to pay for it. In fact, I think a case can be made for the idea that once Facebook introduces more paid placements into the feed, even fewer organic brand mentions will show up there. So much for engagement, eh? Since social media success is typically very time consuming, it’s hard to see how smaller businesses can make this pencil out. Yet, larger businesses that can afford Facebook’s new model have ALWAYS had plenty of options for reaching their customers. They need Facebook far less than SMBs because they can just as easily advertise via TV, radio, search, sponsorships—or by building out owned networks (though that isn’t easy). By betting the bank (or more likely the IPO) on big brands and abandoning the little businesses that were the first to demonstrate the power of fan engagement, I think Facebook has made a calculated decision that won’t be ideal for anybody. I certainly can’t recommend that small businesses invest a lot of effort on Facebook in the near term, though I realize that could change again in six months.